Coming off an undefeated season that culminated in a Super Bowl victory certainly was a hard act to follow for the Miami Dolphins in 1973, but while the record was not unblemished, it was still a more-than-satisfactory 12-2. 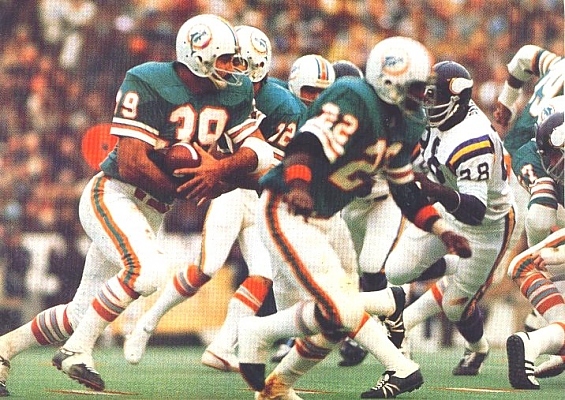 Head Coach Don Shula’s team still featured a strong running game on offense led by the power of FB Larry Csonka (pictured above) and the speed of HB Eugene “Mercury” Morris. QB Bob Griese was efficient and, when he had to throw, he had an outstanding deep threat available in WR Paul Warfield. The offensive line was exemplary and the “No Name Defense” was solid and tough. They again finished atop the AFC East and blew past the Bengals and Raiders to win a third straight AFC title and return to the Super Bowl. On January 13, 1974 the Dolphins defended their NFL title against the Minnesota Vikings, who had also gone 12-2 in winning the NFC Central. Coached by Bud Grant for the seventh year, the Vikings had long been known for defensive excellence, and that was still the case in ’73. The line of ends Carl Eller and Jim Marshall and tackles Alan Page and Gary Larsen was highly experienced and formidable while the linebacking corps was led by MLB Jeff Siemon and ball-hawking FS Paul Krause was in the backfield. The offense was directed by 33-year-old QB Fran Tarkenton and benefited from the presence of two newcomers, WR John Gilliam, obtained from the Cardinals, and rookie RB Chuck Foreman. There were 68,142 fans in attendance – not to mention the mammoth television audience – on an overcast day at Houston’s Rice Stadium. The Dolphins had the ball in the opening possession and methodically drove 62 yards in 10 plays. It was all Csonka and Morris running the ball while Griese passed just twice, to TE Jim Mandich (pictured below) for 13 yards in a third-and-four situation, and to WR Marlin Briscoe for six yards to the Minnesota 21. Csonka ran for the last five yards and a touchdown and, with Garo Yepremian’s extra point, the defending champs were ahead by 7-0. The Vikings responded with a three-and-out series and, after receiving Mike Eischeid’s punt, Miami again advanced almost effortlessly down the field. Once again Griese needed to go to the air just twice, and a 13-yard completion to Briscoe on a third-and-one play gave the Dolphins a first-and-goal at the Minnesota one yard line. Two plays later HB Jim Kiick scored a TD to cap the 10-play, 56-yard drive and it was 14-0 after a quarter of action. It would be all Miami needed. The Vikings had two more possessions in which they failed to generate a single first down while, in between, the Dolphins , largely thanks to a sack of Griese by DT Alan Page for a ten yard loss, had to punt. But on Miami’s next series, they went 44 yards in seven plays to score again. It was much the same story as before – five runs by Csonka, a ten-yard gain by Morris, and a Griese completion to Paul Warfield for six yards. While the Vikings were actually able to stop Csonka twice for no gain on second and third down in a short-yardage situation, the Dolphins added a 28-yard field goal by Yepremian. With just over six minutes remaining in the half, the Vikings finally put together a long drive. Tarkenton connected with TE Stu Voigt for 17 yards on a third-and-eight play, again hit Voigt in a third-and-nine situation for 14 yards, and right after the two minute warning threw to John Gilliam for 30 yards to the Miami 15. But on a fourth-and-one play from the Miami six, RB Oscar Reed fumbled and FS Jake Scott recovered. Minnesota came up empty and the Dolphins took the 17-0 lead into halftime. A 65-yard kickoff return by Gilliam to start the second half was called back due to a clipping penalty and, from that point, the third quarter looked like a reprise of the opening period. The Vikings punted after going nowhere in three plays and Miami put together a 43-yard scoring drive in eight plays. On a third-and-five play, Griese made another of his rare but effective passes, connecting with Warfield for a 27-yard gain to the Minnesota 11. 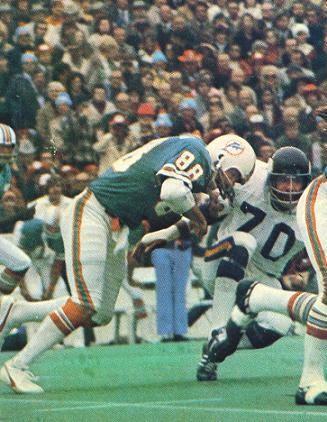 Csonka finished the series off with a two-yard touchdown carry and, at 24-0, the Dolphins had an insurmountable lead. The Vikings finally put points on the board in the fourth quarter. Tarkenton completed five passes in a 10-play possession that covered 57 yards. The biggest play was a 15-yard throw to Voigt in a third-and-eight situation to start the final period. The nimble quarterback kept the ball himself in running around right end for a four-yard TD and Fred Cox added the extra point. Minnesota, in desperation, tried an onside kick that was initially successful but was nullified by an offside penalty. The Dolphins got the ball and punted following a short series, and the Vikings, taking over at their three yard line, drove into Miami territory. The highlight of the drive was a swing pass to RB Ed Marinaro that gained 27 yards, but the series stalled at the Miami 32 and Tarkenton’s long third down pass intended for WR Jim Lash was intercepted at the goal line by CB Curtis Johnson. That was it for the Vikings. Miami controlled the ball for the remaining 6:24 and the Dolphins were once again champions by a score of 24-7. The Dolphins had more total yards (259 to 238), with 196 of that total coming on the ground, and accumulated more first downs (21 to 14). The Vikings turned the ball over twice, as opposed to none suffered by Miami, and were also penalized seven times at a cost of 65 yards while the Dolphins were flagged just once. Larry Csonka was the game’s MVP as he rushed for 145 yards on 33 carries and scored two touchdowns. 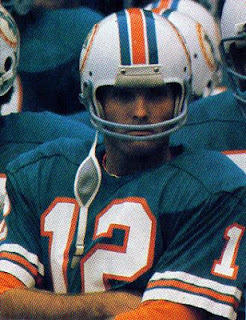 Bob Griese (pictured below) went to the air only 7 times but completed 6 of those passes for 73 yards. Paul Warfield, Jim Mandich, and Marlin Briscoe all caught two passes apiece, for 33, 21, and 19 yards, respectively. For the Vikings, Fran Tarkenton was successful on 18 of 28 throws for 182 yards with no TDs and one interception – he also ran the ball four times for 17 yards and a touchdown. Oscar Reed led the club in rushing with 32 yards on 11 carries while Chuck Foreman was held to 18 yards on 7 attempts, although he caught 5 passes for 27 yards. Stu Voigt gained a team-leading 46 yards on his three catches and John Gilliam was right behind with 44 yards on four receptions. Several weeks following the Super Bowl win it was announced that Csonka, Warfield, and Kiick would be jumping to the World Football League’s Toronto Northmen (later Memphis Southmen) for 1975. While a distraction, the Dolphins still topped the AFC East with an 11-3 record in ’74, although the quest for a third straight NFL title ended in a memorable Divisional Playoff loss to the Raiders. Minnesota went 10-4 in winning the NFC Central and advanced once more to the Super Bowl, but lost to the Pittsburgh Steelers. While the Vikings won a pre-merger NFL Championship and three NFC titles during the Bud Grant coaching era, they fell short in all four Super Bowl appearances.